Once Lotus notes To Claws Mail converter is installed on your system Launch it and convert all your Lotus Notes emails to MBOX file format without any data loss. As all the files converted from NSF to Claws Mail file format i.e. MBOX, you need to import these files to Claws Mail application. 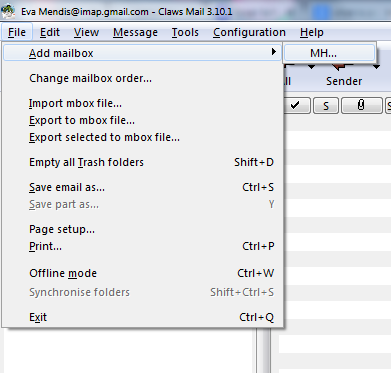 Open it and Go to File > Add Mailbox > MH (You need to create a separate mailbox to import mails). Now enter the name of converted mailbox to open in Claws Mail app as display in given screenshot & Click Ok button. Choose the file from an open window (User can import one or more .mbox files). Now by using Import mbox file option under File tab, and you are able to import NSF file to Claws Mail. After that Browse the MBOX file form your system to view in Claws Mail & also browse location of destination folder. Finally you will see the folder is displayed on claws mail application as in mention screenshot. Just double click on the folder and you can easily read the NSF emails in Claws Mail. IBM Notes create so many data files that signify specific reason, but two files among them are mainly used for data storage, i.e. names.nsf (for address book) and username.nsf (for Mailbox). There is no other secondary application that can access NSF File other than Lotus Notes itself. Claws Mail is a free and open source, GTK+ based Email and News Client. The appearance and interface are designed in such a way that new users get familiar with it very quickly. The messages are managed in the standard MH (Message Handling System) format and the MBOX (Mailbox) format via a plugin. Claws Mail runs on both Windows and Unix-based OS. Both the applications Lotus Notes and Claws Mail support different file formats for storing their respective data items. Lotus Notes uses NSF (Notes Storage Facility) and Claws Mail uses MBOX (Mailbox) as their default database. We cannot access the NSF File in Claws Mail directly. Therefore, in order to access Lotus Notes data in Claws Mail, we need third party application. No Manual method developed yet that could perform migration of Lotus Notes database (NSF File) to Claws Mail database (MBOX files). Import and Export Options are available in Claws Mail but it supports its own file type only i.e. MBOX. "Before investing on the tool's purchase I wasn't so sure about the performance being this good. I was stunned by the speed and accuracy rendered simultaneously by the software with no compromise. A huge thanks to the developers and designer"